Funko Specialty Series: South Park Mr. Garrison Pop! In an effort to recognize their most special accounts and loyal retailers, Funko is continuing our Specialty Series. Every month, they announce an exclusive – this month includes a Pop! Why is it so special? You’ll only be able to find these Specialty Series exclusive in boutique retailers, specialty stores, local comic book shops like Forbidden Planet International. This is your chance to help support local businesses and smaller retailers, and you’ll pick up an amazing exclusive item in the process! 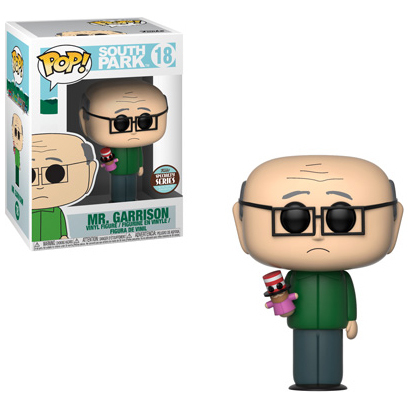 Our latest exclusive is a South Park Mr. Garrison Pop! Remember, this fantastic piece is exclusive to the Specialty Series, and only available for a limited time. So pay a visit to your local store this autumn / winter to see if you can catch one! Tried to pre-order today in Glasgow but they didn’t know anything about it? This was literally announced less than 24hrs ago, they are now aware of this item, but unfortunately due to it being in the Specialty Series we can not take a pre-order on them. I’m sure if you keep an eye on Glasgow’s social media channels you will see when he lands. I made a typo in the original post to “pre-order” which I have now edited. Apologies for any confusion.